Owing to the support of our qualified and dexterous professionals, we are able to provide an impeccable range of Poultry Mesh that is fabricated in compliance with set industrial guidelines. Moreover, we utilize superior quality unmatched quality materials and contemporary techniques to manufacture these products. In addition to this, our quality experts check these products on diverse parameters to ensure their reliability and finest quality. Wire Diameter: BWG14-28Aperture: 3/8' 1/2' 5/8' 3/4' 1' 5/4' 2/3' 2' 3' 4'Width: 0.914M, 1MColor: Grey, green, yellow etcNote : Prices May Varies as Per The Specifications. 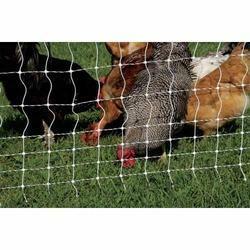 Looking for Poultry Mesh ?